Increase revenue and position your company as a top Google reviewed business. Broadcast the good immediately and filter negative reviews to allow to improve customer retention. 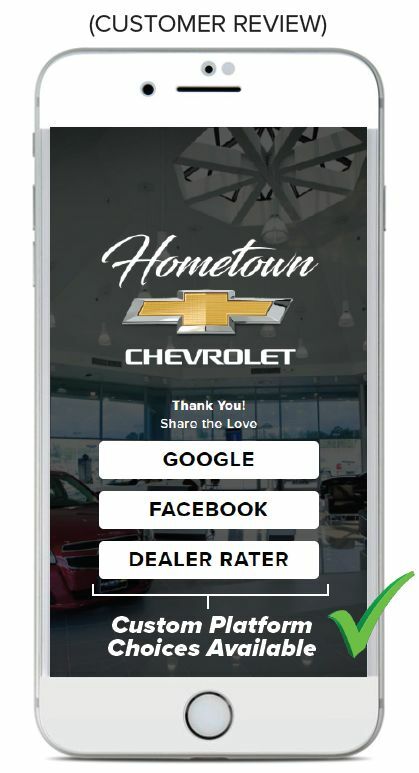 Control your own Google and Facebook reviews. Helps identify internal issues and solve problems before they become published online. Responding to all customer reviews* on your behalf creates trust and loyalty in your brand. Puts the power of word-of-mouth in your hands. Intuitively convert positive customer feedback to social media platforms instantly. Negative Review* Alerts - direct live phone call and email to dealer. Don’t rely on automated Google review platforms. Out-of-state out-of-mind. After the transaction is over and customer has left, chances of getting reviews is minimal. Use your employees to multiply your online reviews with invaluable face time. Proprietary reputation platform puts Google in your hands. You are the driver. Engage your staff to build stronger customer relationships with one-to-one interaction.